I'll admit it, I was a little nervous. Meeting other garden blogger's in real life? It was a bit intimidating. A collection of fantastic garden bloggers coming together to swap plants, enjoy our host's gardens and get to know each other...off line. I'm really not sure you can ask to spend an afternoon with a nicer group of people. Oh yeah, there were some pretty cool plants too. 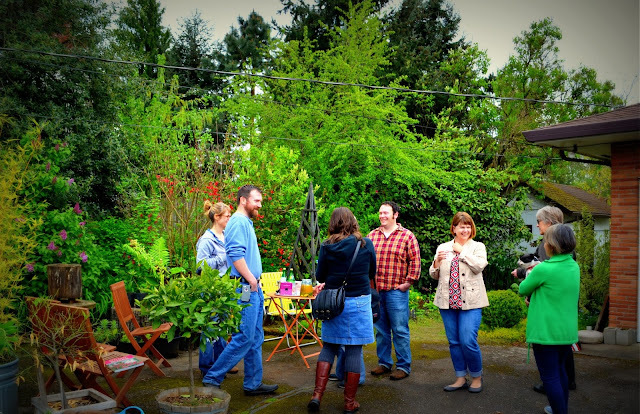 Then, to my delight, a few blogging friends from the Seattle area drove down to join our little party. We got really excited by the great selection of plants they brought to swap. 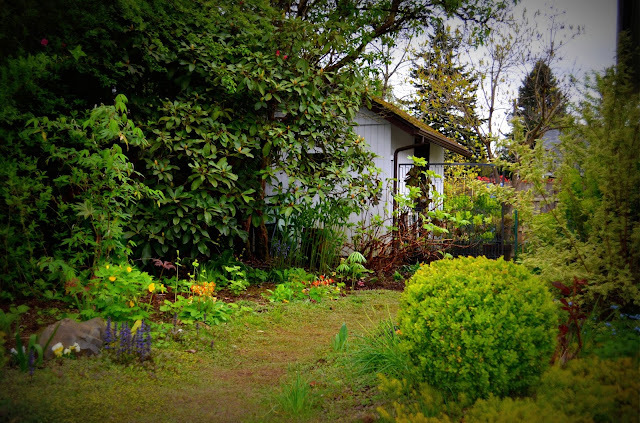 Our host, Linda, has gorgeous gardens around her home. She said she has been cultivating them for seven years. Here are some of my favorite spots in her gardens. 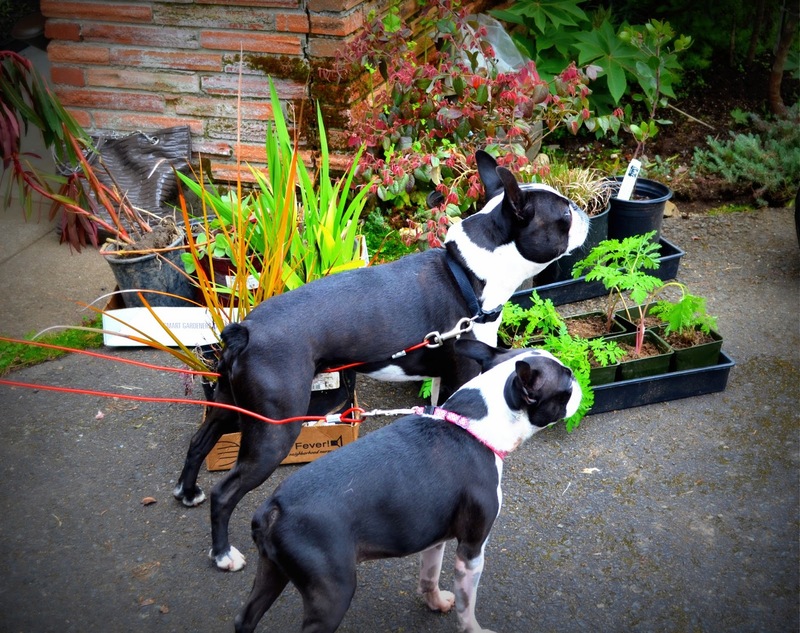 And of course, Linda's fine gardening helpers. Gardening for me, has been a solitary experience, other than corresponding with my online garden blogging buddies. Sometimes, I rope unsuspecting neighbors into going to plant shows or visiting nurseries. (poor souls, they have no idea what's in store for them) But, today, I was in the mist of other plant connoisseurs and I enjoyed every minute of it. Here are their blogs, I highly recommend you take the time to visit. 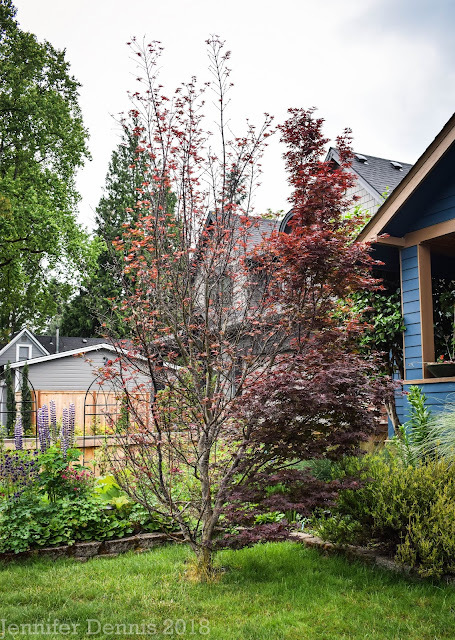 PNW gardeners are passionate about growing and we have this incredible climate with which to grow and experiment with zone bordering plants. We are always up to something new. What a great post! I managed to not take a single photo at the swap. I was so busy talking and looking at the garden and playing with the dogs! It was great to meet you (and Rusty too), and I'm so glad you enjoyed it. Gardeners are good people, and garden bloggers are the friendliest bunch! As for avoiding pictures, well, I guess I'm a bit of a ninja, Hehe! You are quite shy, my friend! I was surprised as I looked through my photo's that I had not captured a single one of you! Nice write-up of a great get-together. I enjoyed getting to know you and others "up close and personal". Thanks for fixing the comments glitch...looks like we're good to go. Yah, I'm glad that got fixed! This looks like great fun! I would love to meet some fellow bloggers in "real life" too. Maybe someday! If it's at all possible, do it. So fun. BG - we also have an facebook group that helps us stay in touch, ask questions, etc. It's really nice to mingle with folks that have similar interests. I really enjoyed your garden photos and I am pulling the blogs you suggested. Thank you so much for sharing. Jenni, what beautiful pictures; the fading darker at the edges is a great look! Did you do that on picassa or is it a different photo editing program? The get together was so much fun! I was also intimidated by the thought of meeting all of you fabulous gardeners and bloggers but it was a blast & everyone was extremely nice! Thanks for including Alison and me! What a cool event! Garden on! Sneeky with the camera! I didn't even notice you snapping away. I was so happy to finally meet you, glad you came. Maybe we'll have to plan something before the fall swap?! What a lovely garden, and what a great idea to meet up. 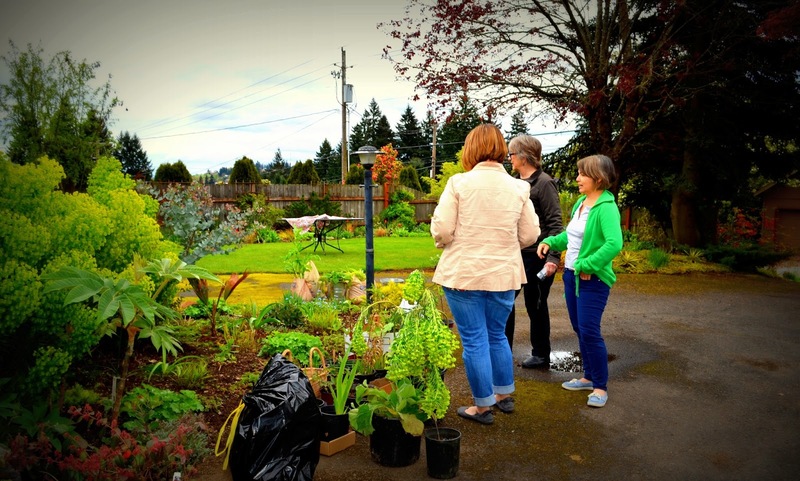 The plant swap is a great idea too. Can I say I'm jealous! :) How fun to get to meet other bloggers in person! 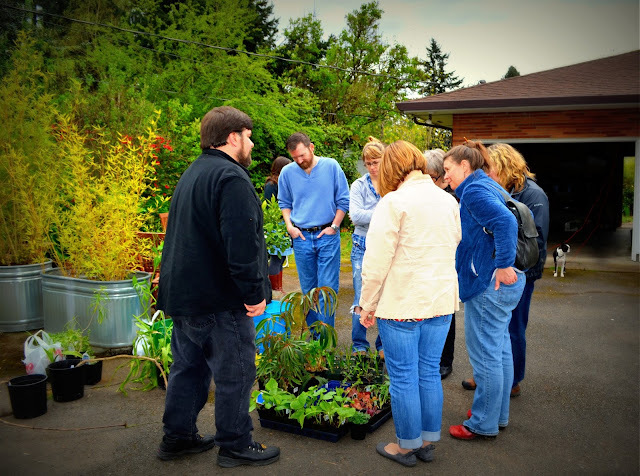 I've gotten to meet some and it is so fun to be around other gardeners that love it in the same way I do. What a beautiful garden to get to visit while you all got to visit. I agree...the first time you meet someone you've only known online is a bit nerve-wracking (what if they're psychopaths?). Glad you could make it...it really was fun, wasn't it! Oh goodness! Quite sorry Linda! I've added you to the list! Thanks for the nice recap, Jenni! Great photos too! I had such a grand time hanging out and meeting all of you! Yes, I too was a bit intimidated, but that feeling evaporated quickly. So fun to be with like minds! Spent the entire Sunday creating new homes for the goodies I brought home! And - created new homeless plants in the process - some of which might be of interest to you. List to come soon... My favorite kind of day - when you let your hair down at night, and a pile of leaves and sticks fall onto the floor. Thank you all - not just for Saturday, but for a fabulous Sunday too! Oh, do post that plant list. I'm in the market! It was so much fun to meet everybody and see what they brought. I was so paranoid that what I brought wouldn't be "cool" enough. It was really a nice way to meet equally plant crazy people. Matthew, I thought your stuff was super cool! I also live near Portland and have been writing a blog for 3 years this month- www.weedingonthewildside.blogspot.com. I participate in Garden Blogger's Bloom Day and Wildflower Wednesday nearly every time. I'll have to look you up, Hannah! Jenni, I am sorry I had to miss this fun event. As the emails were flying and plants were being offered and accepted, I could hardly believe I was going to be away! Thanks so much for posting this taste of the fun. 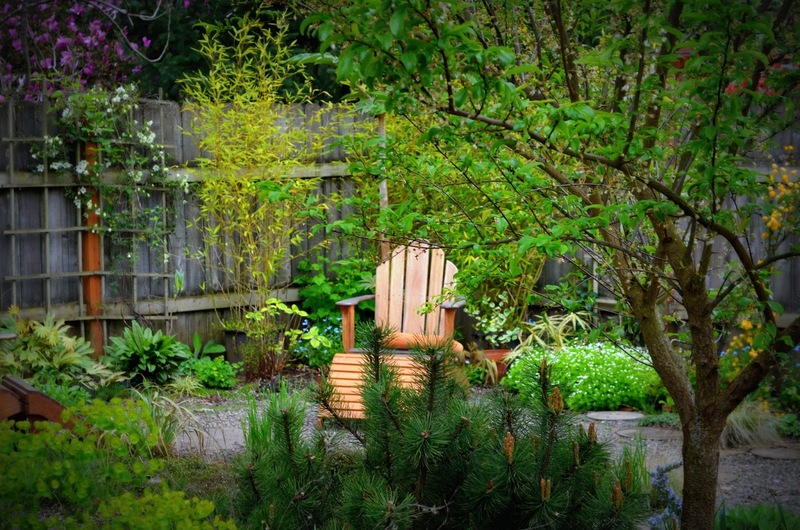 Linda's garden looks beautiful and I'll be wrangling an invitation to visit. Great post, Jenni. There are some unfamiliar faces and names I need to check out. Linda's garden looks amazing. What fun!